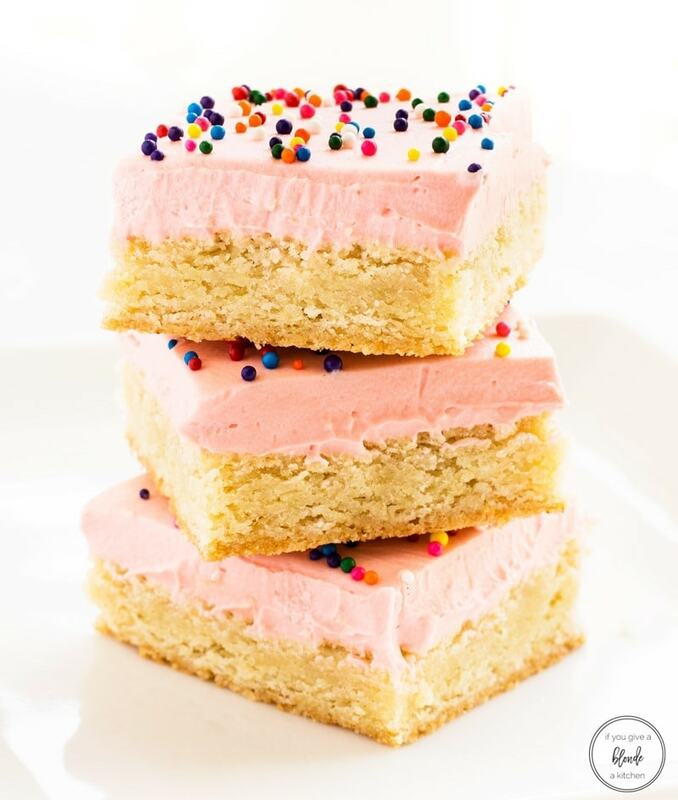 Sugar cookie bars are topped with a pink buttercream frosting and rainbow sprinkles. This easy recipe is a fun and sweet dessert perfect for birthdays! Happy first day of spring! 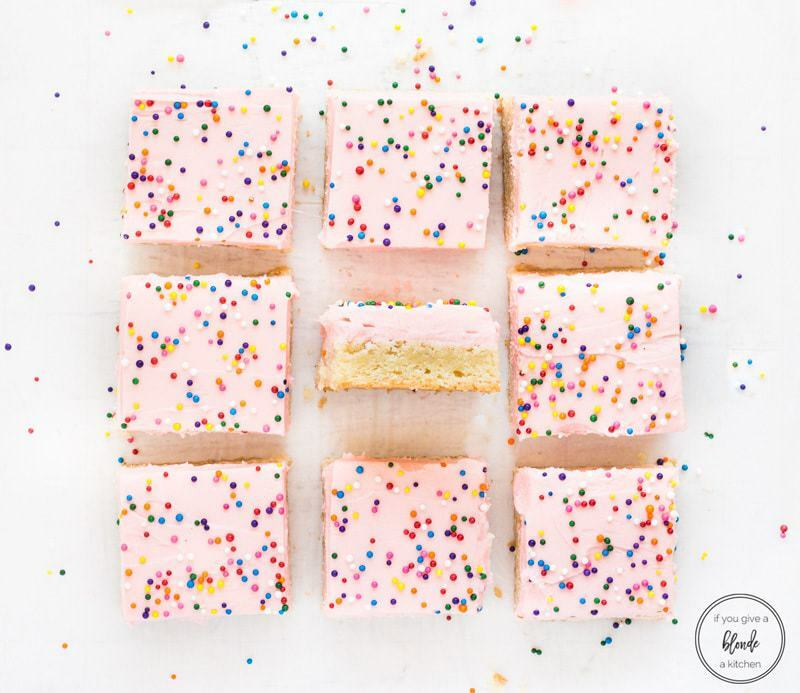 Things are bright and cheery in my kitchen today with these frosted sugar cookie bars. The rainbow sprinkles simply put a smile on my face! I’ve been meaning to perfect a sugar cookie bars recipe for some time now. Baking cookies in one sheet, cutting and serving make things a lot easier! Plus, a sheet pan of cookies just calls for frosting. This recipe is super simple. 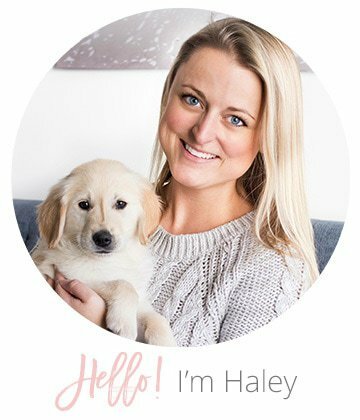 I used a sugar cookie recipe and simply pressed it into a 13-inch by 9-inch baking pan. Bake, cool and frost. There you go! I did, however, want to make sure these cookie bars were thick, chewy and flavorful. No cakey cookie bars here! The secret is cream cheese. Yup, cream cheese and butter make moist sugar cookie bars. In addition to mastering the texture of the bars, I wanted an irresistible flavor. 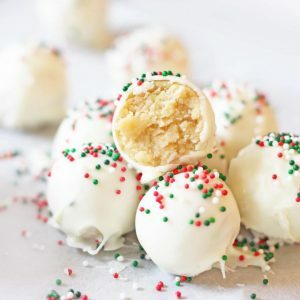 Almond extract is in my opinion the absolute best flavor for cookies (just check out my butter spritz cookies). I did a combination of vanilla extract and almond extract so the latter wasn’t too overwhelming. If you’re not a fan of almond extract, simply omit it and increase the vanilla extract measurement! Once the bars were perfected, I used my buttercream frosting recipe for decoration. A little bit of food dye and sprinkles make these bars extra fun! 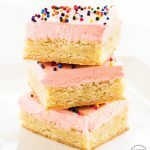 This sugar cookie bars recipe is perfect for birthday parties, girls’ night or simply a weekend treat! 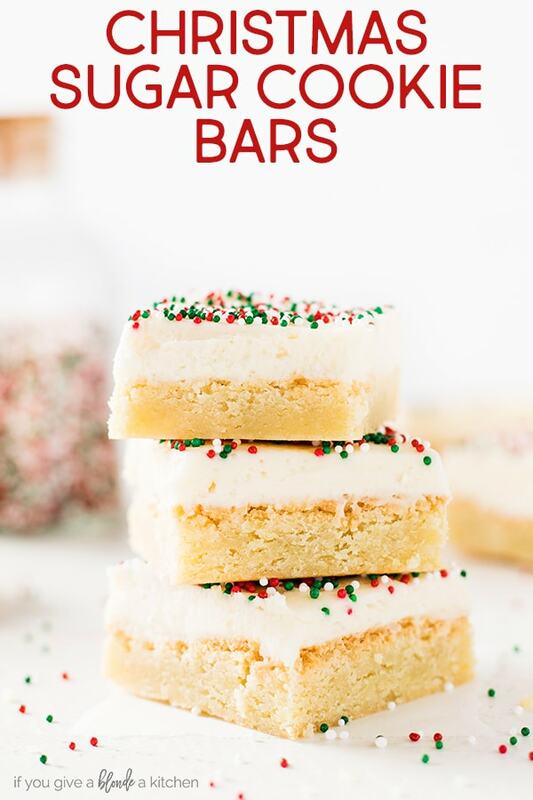 What are you making these sugar cookie bars for? Preheat oven to 350° F. Grease a 9×13-inch baking pan or line with parchment paper. Set aside. In the bowl of a stand mixer (or using a hand mixer), beat the butter and cream cheese on medium speed until smooth, about 1 minute. Add the sugar and continue to mix until light and fluffy, about 3 minutes. Add the egg, vanilla extract and almond extract and mix to combine, about 1 minute. Reduce the mixer speed to low and slowly add the flour mixture. Mix just until combined (avoid overmixing). 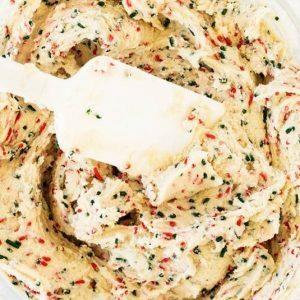 Use a rubber spatula to give the dough a final stir to catch any unmixed ingredients. Transfer dough to prepared baking pan and use a spatula to spread the dough evenly (the dough will be thick). Bake 20 to 25 minutes, or until light golden brown and a toothpick inserted in the center comes out clean. Place the pan on a wire rack to cool completely before frosting (about an hour). With the mixer on medium speed, add the vanilla and beat until fluffy, about a minute. Add milk if frosting appears too thick to spread. Using an offset spatula, spread the frosting on top of the cooled bars and add the sprinkles. Cut and serve! 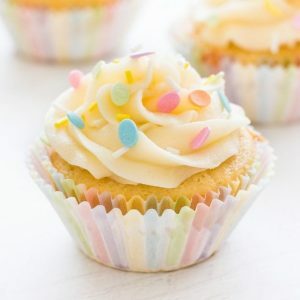 If you do not like the taste of almond extract, omit it and increase the vanilla extract to 2 teaspoons. Store cookies in an airtight container at room temperature for up to three days (or in the refrigerator for a week). 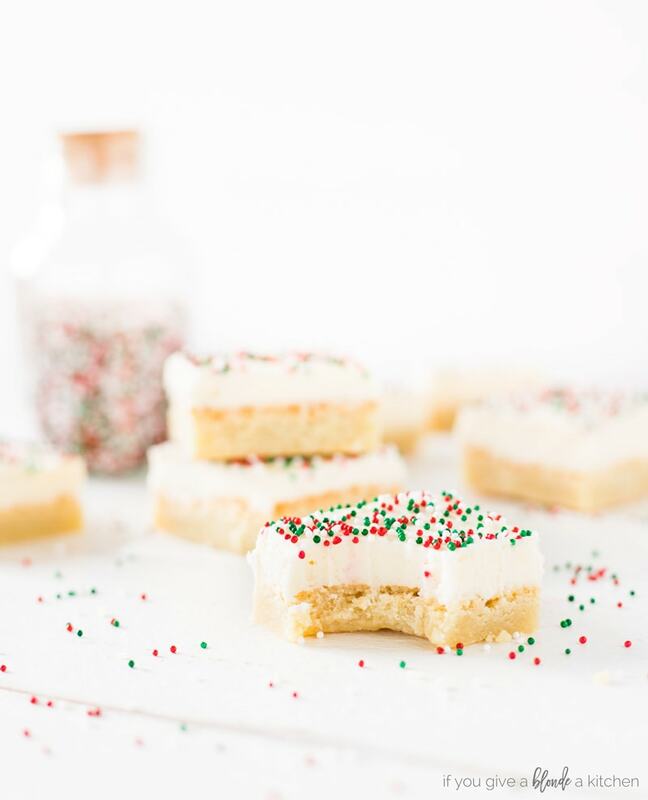 To make Christmas sugar cookie bars, leave the food dye out and use red and green sprinkles! Inspired by Brown Eyed Baker. Thanks Haley, and I think these would also be adorable as an Easter treat. BTW, my boyfriend still says that your Nutella brownies are THE BEST brownies he has ever eaten! These are indeed fun and sweet — and super pretty and tasty, I’m sure. I am definitely going to make these with my kids. They are so cute and I know they will love eating them too. Thanks for the great recipe. They are so adorable and they looks very tasty.